Stress Awareness Month has taken place every year since 1992, with health care professionals aiming to increase public awareness to fix the rising issue that affects so many of us. In order to recognise the event, we are going to take a look at workplace stress specifically, focusing on the causes and ways to reduce it. No matter how much you love your job, you will have faced work-related stress at some point. Pressure to meet deadlines or complete a challenging task are elements of a role that are likely to stress you out- and that’s only natural! Chronic stress, however, can be overwhelming and extremely detrimental to both your physical and emotional health, even when you finish your working day. Although you can’t avoid stress at work completely, there are definitely steps to manage and reduce your stress, controlling the effect it has on your body. Keep a journal to see which situations cause the most stress for you, and how you respond. Record your thoughts and feelings about the situation, people and circumstances involved. This can help you to find patterns and learn to adjust your reactions accordingly. Create work-life boundaries, reducing stress levels when in the comfort of your own home. Technology has made it too easy to be available 24 hours a day, but when not on work time create rules for yourself, such as only checking your emails at one time a day after your shift has finished (e.g. 7pm). To avoid burnout, make sure that you “switch off from work”, where not only do you not engage, but you do not think about work either. This especially applies when you are on annual leave, so you can relax and come back to work invigorated and ready to work to a high standard. Meditation, deep breathing exercises and mindfulness are greatly beneficial at lowering stress. Doing a simple activity for a few minutes each day will allow you to focus without distraction, and eventually begin to lower your stress levels. Visit here for some basic tips. Have an open conversation with your supervisor. Together you should come up with a plan that can help manage the stressors that you have identified. Accept help from family members and friends that you trust. Strong social support is extremely important for stress levels and coping mechanisms. Isolation increases vulnerability to stress. Negative thoughts and behaviour increase workplace stress. Try to break these self-defeating habits! e.g. Resisting perfectionism, flipping negative thinking, breaking habits such as being late. Physical exercise is a mood-lifter, and soothes your nervous system. 30 minutes of activity most days will provide you with maximum stress relief. It doesn’t have to be the gym- why not try and go out for a walk on your lunch break? Lack of sleep affects productivity, problem-solving skills and the ability to focus. You will feel more equipped to handle your job stressors and keep your emotional balance if you feel well-rested. Improve quality of sleep by getting 8 hours a night and avoiding stimulant activity/TV screens one hour before you intend to go to sleep. 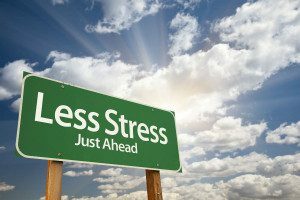 These are our top tips for reducing work-place stress! If you try all of the above and still feel overwhelmed, please do not hesitate to see your GP. What methods do you have to help you reduce your work stressors?